Published: Dec. 10, 2014 at 02:23 p.m. Updated: Dec. 16, 2014 at 09:40 p.m. 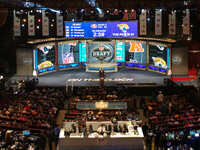 It is not a coincidence that the top football teams in the country are also the programs NFL scouts target when searching for blue-chip players in the draft. The most talented teams typically win the majority of their games and eventually compete for conference titles and playoff berths. Thus, scouts understand the importance of knowing which teams are loaded with elite talents throughout their program. Most important, it is crucial for evaluators to track their development throughout the year to see which players are continuing to refine their games for the next level. 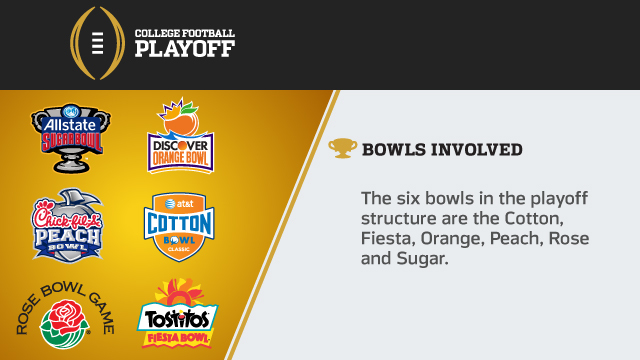 The BCS is gone, replaced by the College Football Playoff. It's the dawning of a new and exciting era, with a four-team playoff starting this season. CFB 24/7 presents a primer to get you ready. Analysis: It's not a coincidence that the Crimson Tide sit atop the list, based on their impressive work on the recruiting trails. Tuscaloosa has become the top destination for five-star recruits looking to hone their skills under the tutelage of a former NFL head coach running a developmental program for the pros. Looking at the overall depth of the roster and the emergence of young stars such as Henry, Jonathan Allen, Arie Kouandjio and Cam Robinson, Alabama will remain a title contender for the next few seasons. Analysis: Jimbo Fisher deserves a ton of credit for fielding a resilient squad loaded with NFL-caliber talent. From the top quarterback prospect in the game (Winston) to one of the most dynamic runners in the country (Cook) to an impressive playmaker in the secondary (Ramsey), the Seminoles have blue-chippers positioned in key spots on both sides of the ball. With a stellar recruiting class on the horizon poised to join a roster brimming with talent, the Seminoles will be a perennial playoff contender for the foreseeable future. Analysis: The top teams in college football not only specialize in talent acquisition, but they also excel in player development. Thus, the Buckeyes deserve a spot near the top of the list after watching a number of young players blossom into stars despite being pressed into action early in their respective careers. The sensational play of Barrett, in particular, is a prime example of the remarkable development place in Columbus under Urban Meyer. Barrett took over for Braxton Miller, a two-time Big Ten Offensive Player of the Year, yet surpassed his offensive totals from the previous year. Given the impressive contributions of young players like Elliott, McMillan and Jalin Marshall, the Buckeyes are positioned to continue their dominance in the Big Ten. » Davis: How do this year's Heisman finalists project in NFL? Analysis: The Ducks have quietly produced 18 NFL draft picks over the past five seasons, including a pair of first-round picks in the 2013 draft, Dion Jordon and Kyle Long. Mariota, a redshirt junior, is considered one of this year's top quarterback prospects. Ekpre-Olomu didn't quite live up to the preseason hype but remains a top prospect because of his tenacity and toughness on the perimeter. Freeman dazzles scouts with his impressive size-speed combination. Although he is just a freshman, Freeman is the franchise running back evaluators covet at the next level. Analysis: The depth of talent in the Tigers' program isn't reflected in their record this season because of the inexperience of their key players, but Les Miles has the pieces in place to make a legitimate run at the title next year. Collins has been superb anchoring a young offensive line, and he has a chance be the next Tiger to come off the board as a Day 1 selection. Fournette, Dupree, Dural and Harris have shown signs of being a lethal combination, but the quartet needs some seasoning to reach its true potential. The Tigers won't participate in the playoff this season, but astute analysts should pencil LSU in on their brackets going forward. Analysis: The Spartans have turned into a bit of an NFL quarterback factory with alums like Kirk Cousins, Brian Hoyer and Nick Foles (spent time at MSU before transferring to Arizona) earning starts this season. Cook could be the next to make his mark as a pro if he elects to bypass his senior season to join the 2015 draft class. Waynes and Calhoun are intriguing blue-chip players who have anchored another solid Spartan defensive effort this season. With Lippett making contributions as a part-time two-way star (WR-DB), the Spartans have become a premier developmental program for future pros. Analysis: The Trojans were a mild disappointment this season based on their collection of talent, but the future is certainly bright for Steve Sarkisian's troops. Led by an efficient quarterback (Kessler) with superior management skills, the Trojans have an explosive offense capable of dropping "40-burgers" on opponents whenever they step onto the field. Agholor, Jackson and Smith are exceptional with the ball in their hands; Sarkisian will spend an entire offseason crafting exotic schemes designed to let them shine on the big stage next year. The potential loss of Williams will weaken the Trojans' frontline, but the return of Cravens gives the defense a stud to build around on the second level. Analysis: Art Briles deserves a ton of credit for whipping the Bears into title contenders by blazing the recruiting trail to secure a number of four-star recruits. Brils is an innovative offensive architect who has specialized in developing offensive skill-position players (QB, RB and WR), as evidenced by eight of the Bears' 18 NFL draft picks since 2009 playing on the offensive perimeter. The trend is bound to continue with Petty and Goodley poised to make their way to the NFL next season. Cannon and Coleman are young pass catchers already piquing the interest of scouts looking for explosive playmakers. In a weekly series, draft analyst Daniel Jeremiah polls five NFL personnel executives about college football's top prospects. Which CFB Playoff team is most talented? Who is Missouri DE Ray's top NFL comp? What is Amari Cooper's rank in 2014 draft? Who will be the Chris Borland of 2015 draft? Who is Badger RB Gordon's top NFL comp? Who is the most disappointing prospect? Who has boosted stock most this season? Who does Ducks QB Mariota remind you of? Which NFL WRs are like Alabama's Cooper? Who is hottest coach outside of Power Five? Who does Georgia RB Gurley remind you of? Which team will win national championship? Analysis: The Bulldogs are regarded as one of the premier programs in the NFL scouting community due to their consistent ability to develop pro-ready playmakers. Gurley certainly qualifies as a potential difference maker at the next level despite suffering a season-ending knee injury. While the injury could push him out of Round 1, scouts still view him as a special talent capable of developing into a Marshawn Lynch-like workhorse in a run-centric offense. Chubb showed evaluators that he is more than a capable fill-in by notching a 1,000-yard season and posting seven 100-yard games as a starter. With Floyd and Wilson poised to continue the Bulldogs' trend of producing solid defenders, there are plenty of reasons why Georgia contended in the SEC East despite suffering through some rough patches during the regular season. Analysis: Hugh Freeze's impressive recruiting efforts have paid immediate dividends for the Rebels. Ole Miss flirted with a playoff berth for most of the season before falling apart following Treadwell's injury against Auburn. Regardless, the Rebels are squarely on the radar of scouts due to the presence of several young blue-chip prospects making their mark at their respective positions. Tunsil and Nkemdiche, in particular, are dominant players with the tools to blossom on the next level. If Freeze can continue to develop his young players at this rate, the Rebels will be a legitimate title contender next season. » UCLA (QB Brent Hundley, LB Eric Kendricks, LB Myles Jack and DE Owamagbe Odighizuwa): Jim Mora deserves kudos for building a budding powerhouse in Westwood. Hundley, a redshirt junior, is one of the nation's top quarterback prospects; Kendricks, this year's Butkus Award winner, is a dynamic player who will outplay his draft status at the next level. » Stanford (OT Andrus Peat, WR Ty Montgomery and QB Kevin Hogan): The Cardinal didn't play up to expectations, but scouts still laud the talent on David Shaw's roster. Peat has a chance to develop into a special talent at a marquee position at the next level. » Clemson (OLB Vic Beasley, QB Deshaun Watson, CB Mackensie Alexander and WR Artavis Scott): Dabo Swinney is the envy of coaches throughout the ACC because of his ability to consistently land blue-chip talents on the recruiting trail. Watson is a franchise quarterback with the potential to lead the Tigers to a playoff berth down the road. » Texas A&M (OT Cedric Ogbuehi, WR Ricky Seals-Jones and QB Kyle Allen): Ogbuehi will continue the Aggies' trend of producing top offensive tackles, but it is the rapid development of Allen that has NFL scouts excited. The No. 1 recruit lacks the pizzazz of a Johnny Manziel, but he is a pure pocket passer with big-time talent and potential. » Texas (DE Cedric Reed, DT Malcom Brown, CB Quandre Diggs, RB Malcolm Brown and RB Johnathan Gray): It's clear to scouts around the NFL that the arrival of Charlie Strong has helped the Longhorns become a tougher unit, particularly on the defensive side of the ball. Brown and Reed played well under the hard-nosed head coach, which is why their stock has shot up the charts in NFL circles.